Practice l ink.com F A ll 2018 51 the C ontra C ts & C ompensation issue Lehigh Valley Health Network supports your need to balance work & home life! We are an innovative and growing health network that consists of 8 hospitals! 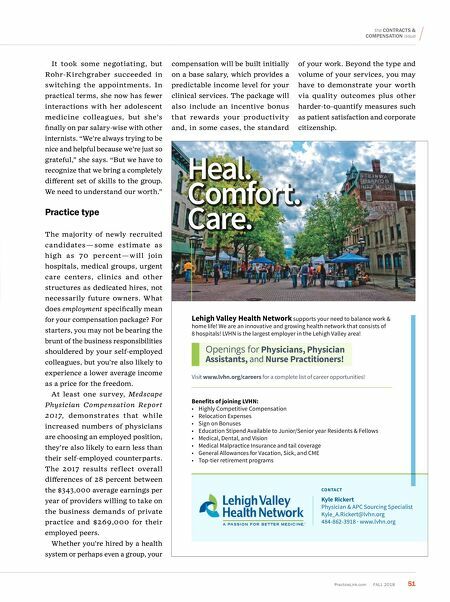 LVHN is the largest employer in the Lehigh Valley area! Openings for Physicians, Physician Assistants, and Nurse Practitioners! Visit www.lvhn.org/careers for a complete list of career opportunities! Benefits of joining LVHN: • Highly Competitive Compensation • Relocation Expenses • Sign on Bonuses • Education Stipend Available to Junior/Senior year Residents & Fellows • Medical, Dental, and Vision • Medical Malpractice Insurance and tail coverage • General Allowances for Vacation, Sick, and CME • Top-tier retirement programs CONTACT Kyle Rickert Physician & APC Sourcing Specialist Kyle_A.Rickert@lvhn.org 484-862-3918 · www.lvhn.org Heal. Comfort. Care. It took some negotiating, but Rohr-Kirchgraber succeeded in switching the appointments. In practical terms, she now has fewer interactions with her adolescent medicine colleagues, but she's finally on par salary-wise with other internists. "We're always trying to be nice and helpful because we're just so grateful," she says. "But we have to recognize that we bring a completely different set of skills to the group. We need to understand our worth." Practice type The majority of newly recruited candidates — some estimate as high as 70 percent — w ill join hospitals, medical groups, urgent care centers, clinics and other structures as dedicated hires, not necessarily future owners. What does employment specifically mean for your compensation package? For starters, you may not be bearing the brunt of the business responsibilities shouldered by your self-employed colleagues, but you're also likely to experience a lower average income as a price for the freedom. 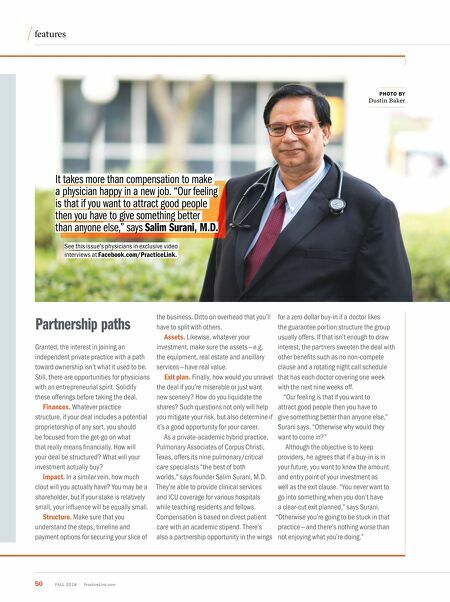 At least one survey, Medscape Physician Compensation Report 2017, demonstrates that while increased numbers of physicians are choosing an employed position, they're also likely to earn less than their self-employed counterparts. The 2017 results ref lect overall differences of 28 percent between the $343,000 average earnings per year of providers willing to take on the business demands of private practice and $269,000 for their employed peers. Whether you're hired by a health system or perhaps even a group, your compensation will be built initially on a base salary, which provides a predictable income level for your clinical services. The package will also include an incentive bonus that rewards your productivity and, in some cases, the standard of your work. Beyond the type and volume of your services, you may have to demonstrate your worth via quality outcomes plus other harder-to-quantify measures such as patient satisfaction and corporate citizenship.